It’s going to be one of those weeks when I have no time to do anything other than work, eat and sleep. So thank heavens for the quick, easy crops that are coming thick and fast from our new vegetable garden. They require no preparation other than a wash under the tap and help me feel healthy and wholesome after a day dining on uninspiring, packaged sandwiches. 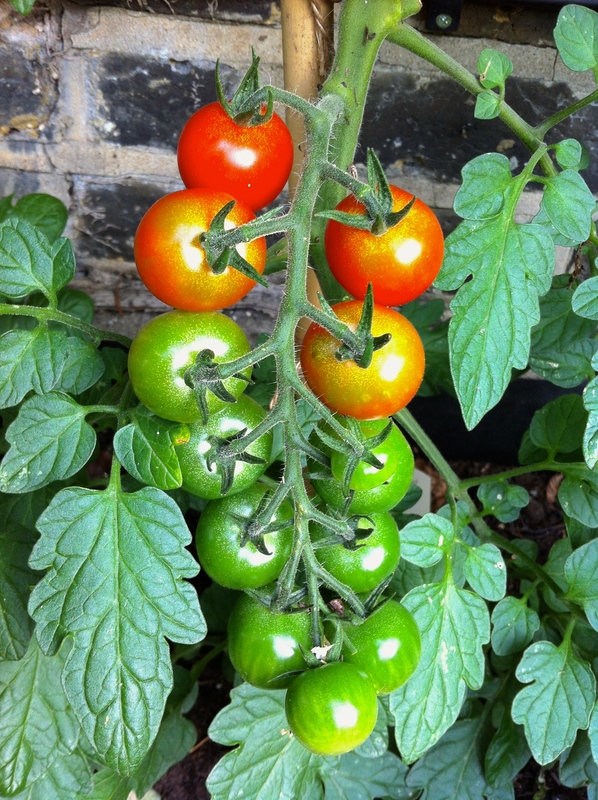 Tomatoes are ripening just fast enough for me to harvest a few glowing fruit each evening. They are sweet, juicy and nicely tart, just as they should be. Herbs are growing at a tremendous rate of knots. 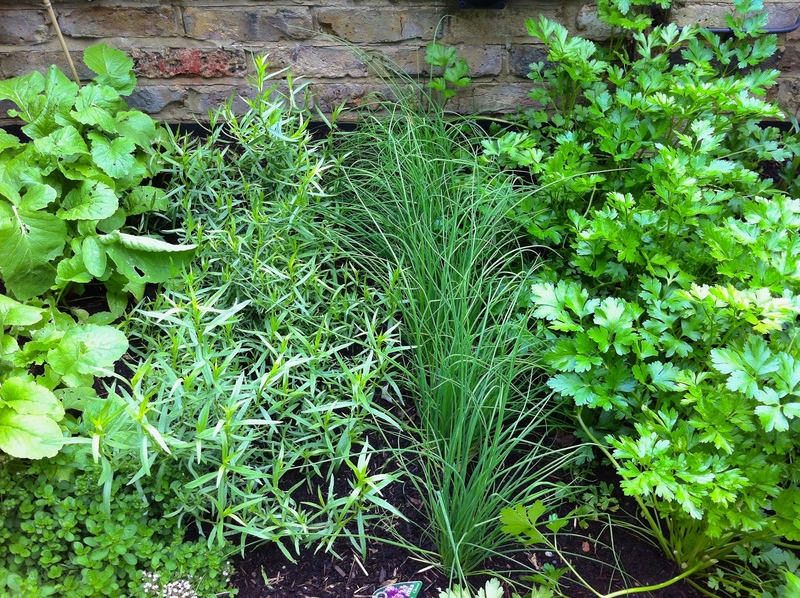 Parsley is lush and glossy green, tarragon (my favourite herb of all) in the rudest of health and chives are fine and tender. We are adding them to curries, pasta dishes and salads in quantities that would be prohibitively expensive if bought from a supermarket. Purchased at Hampton Court Flower Show, a single plant of shiso (Perilla frutescens var. crispa) is forming a pretty, purple-leaved bush with fragrant, tasty leaves. It is used in Japan for pickling plums; we use it as an attractive ingredient in salads when the leaves are very young. 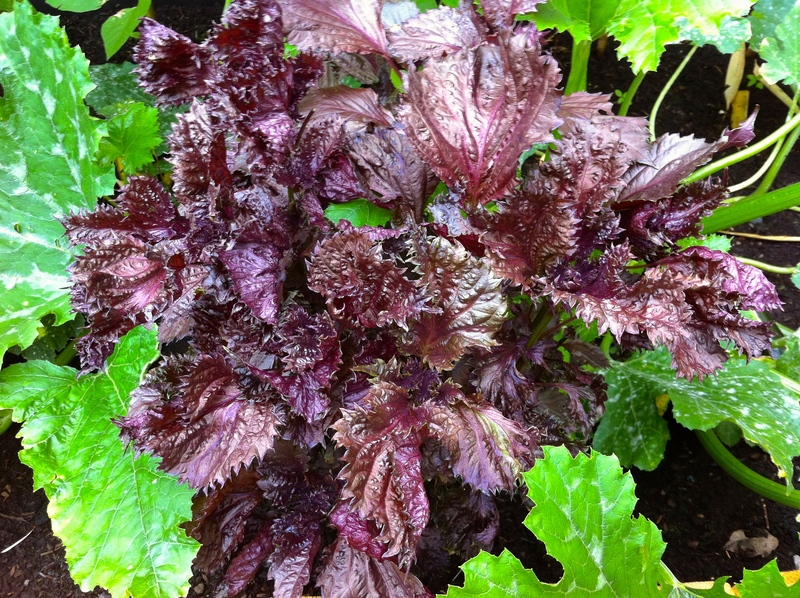 Known as shiso, or ‘beefsteak plant’, Perilla frutescens var. crispa makes an unusual addition to salads and stir-fries. It’s hard to believe that all of these fruits, leaves and herbs were planted just seven weeks ago. A warm July followed by a damp August has certainly helped (although not the courgettes which are rotting) and we are already planting more lettuce and radishes to last us into autumn. Such instant gratification is welcome in a world where we are all so short of time, worth every penny for the superior flavour and there’s no need for waste. These really are our salad days. Tarragon (french) is a perennial. Stuff what you don’t use this autumn into bottles of white wine vinegar for flavouring. Strained, it is brilliant for bearnaise sauce etc. Your columns are much appreciated. Thank you for giving so much pleasure (and ideas)..
That’s a great tip Frances as we have more than we know what to do with. There’s only so many times one can make chicken and tarragon dishes. I shall get some white wine vinegar at the weekend – might even make a nice Christmas gift. Well done, this all looks lovely and very rewarding to eat things you have grown yourself. 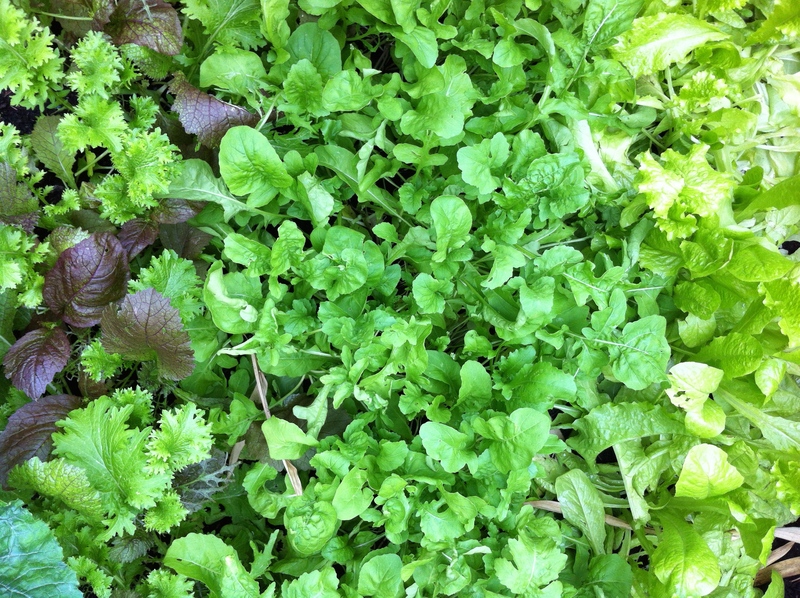 So rewarding, satisfying, exciting…there is nothing to match the joy of growing and harvesting your own. How delicious your dinner must be. Am so thrilled u made the decision to put a veggie patch in. Enjoy!!!! Joy Larkcom and insisted he reads it. At the moment he plants all seeds as if they were cress or lawn seed and is then not interested until they are edible. One just can’t get the staff! oh dear… good help is so hard to find! How lovely to see all that luscious growth! I garden in New Zealand and we’re at the tail end of winter so I am desperate to get going in the veg garden again! If I ever find time to grow and care for any plants, then herbs will definitely be my first priority. I spend several pounds each week on packets of herbs from the supermarket and there is always waste. This is most aggravating and I have begun to resort to dried herbs instead, which may work ok in slow cooking, but not so well when there is only a short coking time. Maybe you could help me set up a low maintenance herb trough? One herb trough coming up! Do you have suitable containers already that I can plant up? Just needs to be weather proof with drainage holes in the bottom. If you start some parsley off now it will grow all through the winter. I do have a few weather proof pots, and I have a small parsley plant on the windowsill that came from the afore mentioned supermarket and doesn’t appear to do a lot (although it is still alive, which is a start). I think I could find time to pot it up later in the week – I’ll let you know how it goes…Out of interest, are the herb plants from supermarkets built to last? I’ve never had much success with them (but then it is me we’re talking about).